Keith sent me to an article on suspended beds which I was intrigued by. I have no clue what the history of hanging or suspended beds are -- this feels like something that would have originated in the 70s -- but with a little bit of imagination they can have a Victorian nautical flair, like the one below. You would think there would be instructions for building one of these on Instructables, but the closest I found was this comment by the owner of the bed below, featured on Apartment Therapy: The suspended bed on our screened-in porch. It took about a day and cost less than $100 to build. Although I confess I didn't do much of the building — my husband and brother are responsible for that. I'm sure you could figure out how to build one, however. Some of the most charming, old fashioned looking hanging beds are for sale at Bedzz without Legzzz. 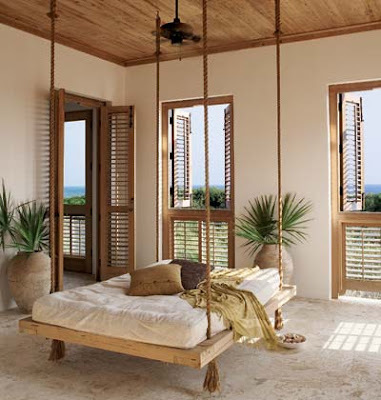 This post reminded me of one of the most beautiful hanging beds that I've ever seen (on tv, that is). The Atchafalaya houseboat was hand-built by Gwen Carpenter and Calvin Voisin in Louisiana in the 1970's. Although it's not steampunk, it's still a beautiful example of the revival of past lifeways and the DIY attitude. These are so cool! I could do enjoy one of these in that tobacco barn I'm going to convert "someday". Too bad dad isn't around to figure this out, it would have been one project he would have enjoyed! Those are cool. Though I don't move around a lot when I sleep/nap, I would probably get dizzy at some point. I need stability in a bed. Krista, I think those are a very beautiful reflection in the happiness of simplicity. I grew up on a farm that looked very similar to that, minus river/lake. During the winter months we had to heat water over a stove and bathe in only a couple of inches of water. I guess we never realize that the saddest days of our lives will be our best memories until those days become your memories. I suppose the main thing would be making sure the hooks were in some sort of structure to hold the weight of bed + person. Hi... Love those hanging porchbeds! 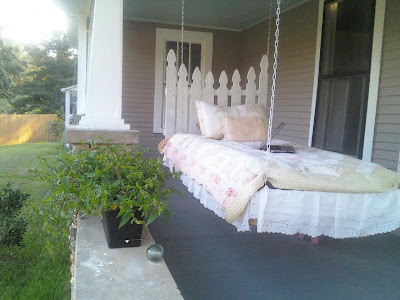 Just to let folks know we custom make hanging porchbeds and porchbed accessories. We ship outdoor mattresses Nationwide that will not mold or mildew. The water drains right out of the foam. Custom size or shape. Plus we custom make outdoor mattress covers and matching pillow shams, throw pillows and bolsters. Made with Sunbrella outdoor fabrics. Fun prints, stripes and solid colors. i love those beds. but any idea how to get one?? Check out floatingbed.com for the most advanced hanging beds. Many of these have been sold, excellent customer service too, which is important when installing one. Ok....I know this is an OLD post, but I love reading back through the archives. I saw this hanging bed and IMMEDIATELY thought of Ana White! For the DIYers out there, she has a WONDERFUL website giving us her plans to build beautiful furniture. Here are her plans for the Hanging Bed. Do you know someone is stealing your articles? He stole part of this one of yours and posted it on his blog. He stole one of mine in it's entirety.